Chocolate is a sweet confection made from cocoa beans. These "beans" are actually the seeds of a pod-like fruit that grows on the cacao tree in tropical areas near the Equator. Nutrition facts and calories in chocolate depend on the variety that you choose and the way it is prepared. A typical chocolate bar provides several hundred calories. As you might expect, the calories in a chocolate bar will depend on what else is in the treat. Chocolate bars and other kinds of candy provide empty calories. Empty calorie foods provide energy primarily in the form of added sugar and unhealthy solid fats such as saturated fat or trans fat. Nutrition experts recommend that you limit your daily intake of empty calorie foods. Adult women should limit their daily intake to 120-250 empty calories per day. Adult men should limit their intake to 160-330 empty calories per day. So does that mean you can't enjoy chocolate if you are trying to maintain a healthy diet? No. It just means that you should enjoy chocolate in moderation. The chocolate nutrition facts listed on the label (shown) are for a standard-sized Hershey's Milk Chocolate bar. Other chocolate candies have similar calorie counts. A Lindt Milk Chocolate Truffle Ball provides 75 calories, 6 grams of fat, 4 grams of saturated fat, 6 grams of carbohydrate and 5 grams of sugar. One packet of M&Ms Chocolate Candy provides 240 calories, 10 grams of fat, 6 grams of saturated fat, 36 grams of carbohydrate and 30 grams of sugar. One serving of Swiss Miss Hot Chocolate provides 90 calories, 2 grams of fat, 2 grams of saturated fat, 16 grams of carbohydrate and 8 grams of sugar. One Hershey's Special Dark Chocolate bar provides 216 calories, 14 grams of fat, 8 grams of saturated fat, 25 grams of carbohydrate and 20 grams of sugar. One Dove Dark Chocolate Promises treat provides 42 calories, 2.6 grams of fat, 1.6 grams of saturated fat, 4.8 grams of carbohydrate and 4 grams of sugar. Most varieties of chocolate is high in sugar and therefore high in carbohydrate. A single serving of milk chocolate contains 25 grams of carbohydrate, 24 of which are sugar. Chocolate is also a significant source of fat, providing 13 grams per serving. Most of the fat in chocolate is saturated fat, although there is some polyunsaturated and monounsaturated fat in chocolate, as well. Chocolate provides a small amount of protein—just over three grams per serving. Chocolate is not a significant source of vitamins and minerals, but you will benefit from small amounts of vitamin B12, copper, manganese, phosphorus, iron, magnesium, and calcium. Chocolate may provide some limited health benefits. The cocoa bean, from which chocolate is derived, is high in flavonoids. Researchers have linked consumption of flavonoids, to certain heart-healthy benefits. However, scientists advise that more research is needed to say for certain if flavonoids can provide these benefits. But not all chocolate is equally healthy. As cocoa beans are processed, the health benefits are minimized. For that reason, you should choose minimally processed chocolate to take advantage of the possible benefits of flavonoids. Usually, the best choice is dark chocolate. But even minimally processed dark chocolate provides sugar and fat, so it should still be consumed in moderation. 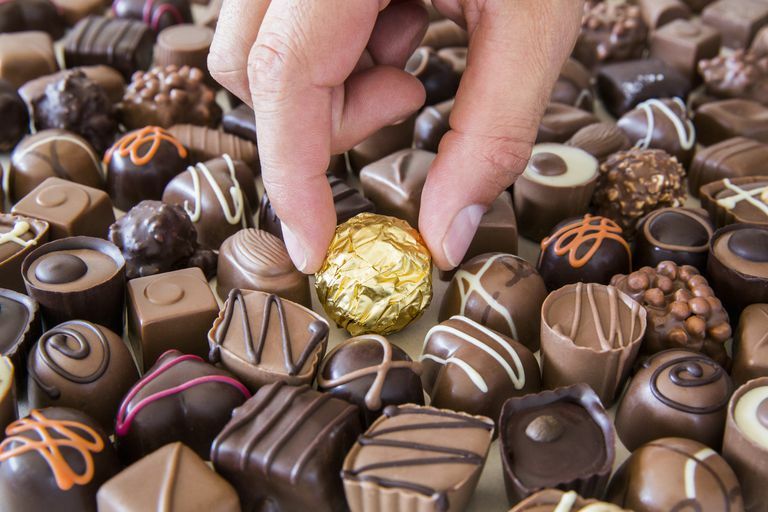 Researchers and health experts advise that even though chocolate may provide some health benefits, there is no reason to indulge in or overeat chocolate since it is still a significant source of fat and sugar. Should I give up chocolate if I'm trying to lose weight? Believe it or not, chocolate can be part of a healthy diet. So if you're trying to clean up your eating habits to slim down, there's no need to toss out your favorite treats. Just learn to manage the calories in chocolate so that you keep your calorie balance optimized for weight loss. What's the best way to store chocolate? It's best to buy chocolate in small quantities because the treat tastes best when it is fresh. Store chocolate in a dark place at room temperature. Do not refrigerate chocolate. Chocolate can be frozen although most connoisseurs recommend against it. If you freeze your chocolate make sure that it is tightly wrapped before putting it in the freezer. Thaw at room temperature. You can keep chocolate in your healthy diet if you like to enjoy the treat. In fact, you can even eat chocolate if you’re counting calories to slim down. But to keep your calorie balance in control, eat a very small amount. Eat chocolate-covered fruit or have a small cup of skim hot chocolate to satisfy your cravings. And if you can, choose dark chocolate. It has a richer taste and is likely to satisfy your craving with a smaller serving. What dieters shouldn't do is put a big bowl of chocolate treats on display at home or in the workspace. It's easy to eat too many snack calories if you're always tempted to nibble. Keep your chocolate treats hidden away in a cupboard or on a high shelf so you don't see them all the time. Then take just a single serving when it's time to indulge. According to the American Academy of Allergy, Asthma, and Immunology, true allergies to cocoa are rare. However, it is possible to have an allergic reaction to chocolate because of ingredients such as tree nuts or dairy used to process it. Oils used to make chocolate products may also produce allergic reactions. And the source notes that "hidden allergens such as insect parts have also been found to be present in chocolate." Katz DL, et al. Cocoa and chocolate in human health and disease. 2011;15(10). National Institutes of Health. Claims About Cocoa. News In Health. https://newsinhealth.nih.gov/issue/aug2011/feature1. August 2011.